Even before we started Redeemed Reader, I read a lot of books. 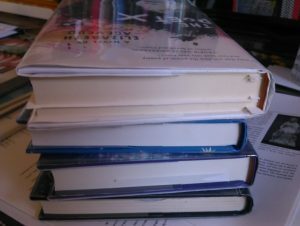 Sometimes I reviewed them for my own blog and sometimes I just wanted to jot down my own thoughts as a response to what I read. The best books encourage pushback! 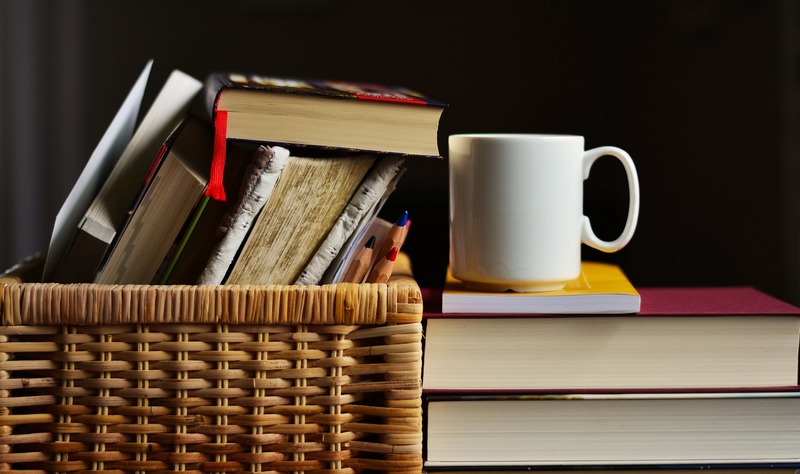 With some nonfiction, I would take notes or write summaries, especially if the information was good for professional development or spiritual growth. The natural place for such reflections is Ye Olde Journal, so most of my thoughts ended up there. 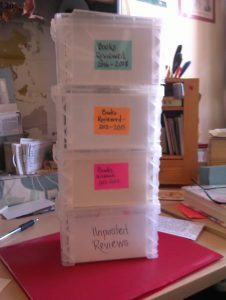 With Redeemed Reader, I committed myself to reading at least two children’s books per week, and quickly realized my notes would have to be more systematic. 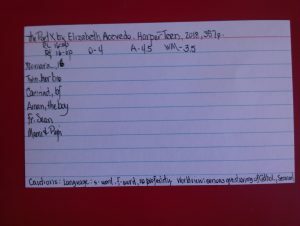 Enter notecards! At first I simply put the title, author, and publisher on the top line and wrote my thoughts on the front and back of the card—or sometimes two cards stapled together if I had a lot of thoughts. As we developed a stable format for our reviews, the cards became more formulaic, evolving into the system I have now. Do you feel geeky? Read on! While reading the book, I use a piece of scratch paper as a bookmark. This is useful for jotting down character names and ages, flagged words like profanity, and other cautions. (Sometimes the cautions are so overwhelming, or the content so underwhelming, I skip the book entirely. Nobody says you have to finish it!) If I come across a quote that’s especially beautiful, thoughtful, or thematic, I mark it very lightly with pencil and tear off a piece of the scratch paper to hold that place. Then the book sits on my desk until I get around to filling out a review card. Ideally within a day or two, but to be frank, review cards are not my favorite thing to do. (They require thinking, and that’s hard work!) But when I buckle down to the task, it goes like this. Cautions: Usually there’s a little room under the bottom line. I use that space to note cautions according to our categories of Language, Worldview, Sensuality, Violence, Vulgarity, Dark/Depressing, Character Issues, or Supernatural elements. 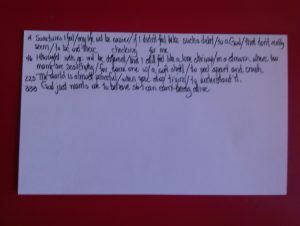 Flipping the card over, I turn it upside-down and copy anywhere from 1-5 of those quotes I flagged, if I still think they’re worth noting. I print very small, so there’s room for at least 3 of these, even on a lengthy review. Then, a brief summary on the front of the card. I write it as a book reviewer would, giving a general outline of the plot without revealing spoilers or resolutions—unless it’s a plot point that parents really need to know. Because I’ve already made a character list, I can refer to characters by initials only, which saves a little time. Next, a paragraph about what makes this book worth reading—or not. 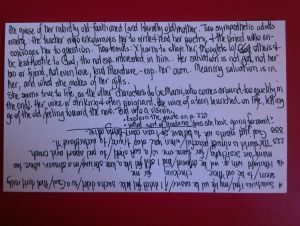 ** This paragraph will often spill over to the back of the card, so I just flip it and keep it right side up so my thoughts won’t interfere with the quotes. And the back, with some standout quotes. Back to the front, with paragraph summary and evaluation . . . I keep these cards on my desk until I get around to reviewing them on RR (drawing almost word-for-word from what I’ve already written), or determine that I’m not going to. For reviewed books, I add a red-ink notation in the upper right corner of the card with the month and year the review was posted. I’ve been doing this for almost seven years, and this is the result: four full or nearly-full boxes of cards. In the past I categorized them by age level and fiction/nonfiction, but it’s easiest just to file them alphabetically. Would it work for you or your kids? Why not? Clearly, you don’t have to be as detailed or systematic: just the title and author, a simple rating (such as from 1 bookworm to 5 bookworms), and a paragraph or two stating what it was about (not the entire plot!) and why you did or did not like it. I wouldn’t recommend making the kids fill out a card for every book they read, but once a week or so it wouldn’t be a bad way to encourage reflection and evaluation. And if it’s good for them, how much better for you? *This is an important distinction arrived at after much discussion: a book with excellent moral value may not be written very well, and a beautifully-written or illustrated book might contain treacherous values. **Generally we only post reviews of books that have some worthwhile angle (mind-expanding, sympathy-enhancing, knowledge-building, or just plain fun), even if they’re not 100% simpatico with a Christian worldview. .Occasionally, though, we’ll post a review of a book that’s received lots of press or prestigious awards, or just got made into a movie, or is somehow emblematic of our age. These books are worth knowing about, at least, and if your own kids are asking about them, we might be able to supply you with enough information to help you make a decision. Some of these books may even be worth reading and talking about (see our guidelines for Discussion Starters).